This post ran on 22 September 2008 originally. I came across this on Apartment Therapy this week and I couldn't pass it up. I love the work of Charles and Ray Eames as I've said before on many occasions. 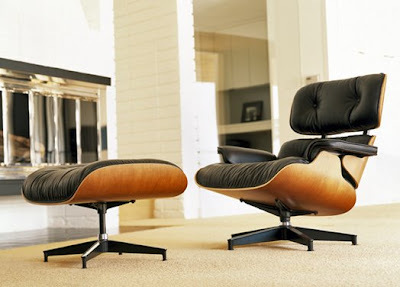 In 1956, the Eames' released their Eames Lounge and Ottoman through Herman Miller. Herman Miller still produces them now, but in 1956, the Eames/ Herman Miller combination hit pay dirt and released an instant classic. This chair is a design icon for obvious reasons. Designers go ape over it still and it remains as popular now as it was at the time of its unveiling. An industrial designer named Joanna Hawley took her inspiration from the Eames Lounge and Ottoman and used that inspiration to design a prosthetic leg while she was a design student at Carnegie Mellon University. Hawley partnered up with Kayhan Haj-Ali-Ahmadi, a pre-med student. Kayhan's knowledge of anatomy and Joanna's design skills combined to terrific effect and the fruit of their partnership speaks for itself. When I think of prosthetic limbs, If I think of prosthetic limbs, the idea that they should be beautiful never occurs to me. When it comes to medical devices, I always assume that function trumps form every time. Who says they can't work together? Clearly, not Joanna Hawley. Prosthetics generally lack humanity, style and grace. Often, they look much like landing gear and make the wearer uncomfortable, self aware, and sometimes depressed. By channeling the Eames' use materials and iconic style, we designed a leg with Steve McQueen in mind. We sought to convey a creative use of positive and negative space, a balance of materials and a reflection of the wearer. Today's generation is faced with the Iraqi war, particularly the reality of soldiers coming back without limbs. Diabetes is also the leading cause of amputees in America, which is a little known fact. Finally, as an Industrial Designer, its my job (and passion!) to think of ways to improve people's lives. All these reasons simply rolled into one very intense and exciting project. I've always been a huge fan of Ray and Charles Eames (as you can probably tell by the rest of my work) and I wanted to give this prosthetic a very eye-catching aesthetic. I know veneering can be polarizing, but so far people seem really excited by the possibilities. And really, that's what the point of the project was, to identify the possibilities in the future of prosthetics. Get this woman an award. Amen. Get this woman a BIG award. I have been smitten with this thing for years. Who knew it was possible to be smitten with a prosthesis?